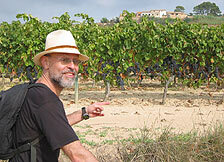 Fermentation's Tom Wark has announced the winners in the 2008 American Wine Blog Awards. More than 2000 people voted in this year's competition over the course of last week. Now that the voting has finished, I am truly pleased and touched to have received awards in both the Best Wine Review Blog and the Best Single Subject Wine Blog categories. There were many worthy blogs that were nominated by appreciative readers, and the list of finalists was impressive in every category. Congratulations to all of those who were nominated. You can check out the full list of those winners here. When I made the decision to continue with this blog, it was because it was clear to me that there were a lot of people out there who drank affordable wine every day and who felt that their needs for wine information were not being met by traditional media. Their needs weren't being met in large part because folks seemed to think that if you didn't spend much money on wine, you weren't really interested in it. I think that's totally false. If you are new to the blog, you will discover that I write about everyday wine culture, and promote the people I think contribute to it in this country and around the world. This includes winemakers, bloggers, the mainstream press, merchants, consumers--you name it. Good Wine Under $20 is not a narrow topic--it's a world that many, many wine consumers occupy. Thank you to the many everyday wine aficionados who have indicated that they appreciated this approach since GWU$20 opened its doors to visitors. There's a lot of good wine out there to discover--I look forward to sharing that world with you. Congratulations Dr. Deb! Well-deserved in both categories! Congrats! A great feat and well deserved. Wow, a double! Congrats, Deb, you richly deserve it! Many people knew that you were doing a good job. Now you know too! It's good that you are proud. Way to go Deb! Keep collecting those awards, you deserve them. You have a wonderful site! Congratulations Dr. Debs. Well deserved. Keep up the great work. Your readers (and voters) love your blog. Deb, this is truly fantastic news, and I am so very happy for you. Blog on!! Congratulations!! You deserve every success! Thanks to you all for your good wishes and applause--couldn't do it without you, that's for sure! Double congrats are due, Debs. Way to go!